Most of us were introduced to the concept of open-ended and closed questions when we were in teacher preparation programs. We were taught that an open-ended question was likely to draw out a longer response than a closed one. By turning a closed question that can be answered with a specific piece of information ("What answer did you get for number 5?") to an open-ended one that allows for more than one response ("How did you get the answer for number 5? "), we can provoke more insightful commentary from students. But open-ended and closed questions describe student response formats. Although these are important considerations for bolstering engagement, they don't fully address the teacher's purpose for asking either question in the first place. A core assumption is that the things a learner says and does make perfect sense to the learner, based on what she knows and doesn't know at that moment in time. This is a big assumption, because as teachers we tend to be more comfortable with assessing the rightness or wrongness of an answer, as opposed to its source. Quite frankly, it's easier to simply evaluate whether the student was able to play a game Doug calls "Guess What's in the Teacher's Brain." Embracing an assumption of partial understanding is more difficult, especially because it demands rapid analysis, formulation of a hypothesis, and then creation of a plan for instructional response. In guided instruction, these decisions must occur in seconds in order to provide a prompt or cue. In his book Blink, Malcolm Gladwell (2005) devotes a chapter to the concept of "thin slicing," the ability "to find patterns in situations and behavior on very narrow slices of experience" (p. 23). He notes that many professions have unique terms for this—in basketball it is called "court sense," and in the military it is referred to as coup d'oeil ("power of the glance"). In teaching, it's called instructional decision making. In many ways, this is the art and science of teaching in that it combines the knowledge that comes from closely observed learning events with the technical tools and research that we use daily in our classrooms. One without the other is not enough. Much of the information that we gather during guided instruction comes in the form of questioning. It is important to note that the mere existence of a question mark doesn't automatically indicate that the teacher is checking for understanding. As we will describe in more detail throughout this book, it's the intent that matters. A cue or a prompt can be delivered in the form of a question, but it's still a cue or a prompt. However, when checking for understanding, we are posing a question for the purpose of figuring out what students know and don't know. Without the intent to analyze, hypothesize, and respond, the power of the question is unrealized. Teacher: What is a nocturnal animal? Student: An animal that stays awake at night. Teacher: Good. What is a diurnal animal? Teacher: Tell me more about that. Does a nocturnal animal have special characteristics? Student: Well, it doesn't sleep a lot. In both cases, the teacher considered what the student knew and did not know and followed up with a prompt or a cue to scaffold the student's understanding. The ability to do this is not innate—we do not believe that some people are "born" teachers. But too often we don't recognize where the learner might get stuck. There's even a name for this phenomenon. It's called the "expert blind spot," and it describes the inability of inexperienced educators to understand the stance of novice learners (their students) in learning a new concept (Nathan & Petrosino, 2003). In particular, experts tend to overestimate the relative ease of a task. That's actually good news for all of us involved in education, because we can turn that expertise into scaffolds for students. The ability to check for understanding, hypothesize, and then follow with a cue or a prompt can be learned through a combination of experience and purposeful attention. Research on the expert blind spot contains advice on how to move beyond it, and it is no surprise that the advice rests on drawing purposeful attention to the misconception. When teachers are made aware of this phenomenon, and this is further coupled with developmental and pedagogical knowledge, the blind spot grows smaller (Kelley & Jacoby, 1996). This finding is consistent with what is known about the effect of misconceptions on the learning of children and adolescents. When the teacher anticipates the misconception and draws purposeful attention to it, accurate learning can occur (Bereiter & Scardamalia, 1992). Much of this process happens through guided instruction. Ms. Wainwright: We've been studying about light in science. Let's start by talking about what you know so far. I'll write it down on the chart. Rebekah, can you begin? Tell me one thing you know about light. Rebekah: We learned that the light we see outside comes from the sun. Ms. Wainwright [writing]: That's a great start. Tell me more about the sun. How would you describe it to someone? Rebekah: Well, it's big and yellow, and it's in the sky. Ms. Wainwright: That's an interesting description. Let's take that apart. You said it's yellow. How do you know that? Rebekah: I can look up and I see it. You can't look at it for long 'cause it'll hurt your eyes. Ms. Wainwright: Are there other ways you know the sun is yellow? Rebekah: When you draw a sun you always make it yellow. Ms. Wainwright: What if an astronaut were drawing a picture of the sun when she was in space? Would she draw it yellow? Rebekah: Yep, 'cause that's what it looks like. Ms. Wainwright: So even in space the sun is yellow? This short exchange unearthed exactly what Ms. Wainwright had anticipated— despite some good instruction, Rebekah persisted in believing that the sun itself was yellow, as opposed to understanding that it appears to be yellow due to the refraction of white light by Earth's atmosphere. Based on Rebekah's responses, as well as similar conversations with other learners, the teacher knew that she would need to do more direct instruction to dispel this misconception. Her next lesson would consist of photographs of the sun taken from Earth and from space, direct explanation about the misconception, and another lab designed to challenge students' reasoning by asking them to investigate why clouds appear to be white, not yellow. "I have to keep asking questions to check for their understanding," Ms. Wainwright later said, "but I'm not looking for them to regurgitate the information. When I ask questions that require them to explain and justify, I find out where their scientific knowledge ends and naïve understandings take over." What Do You Do with Their Answers? As Ms. Wainwright demonstrated, asking questions to check for understanding should do more than merely sort right answers from wrong ones. As a matter of intent, questions posed to check on student understanding should feed forward to modify future instruction (Fisher & Frey, 2009b). This is part of a multipronged approach to formative assessment that includes feeding up and feeding back. Feeding up occurs at the onset, with clearly established purposes for learning, including content and language objectives. These purposes are specific to the individual lesson and are not restatements of the standards, which are much broader and usually require multiple experiences. For instance, a content purpose in an 8th grade social studies lesson is to identify examples of religious and class discrimination against Irish workers in the first half of the 19th century, and a language purpose is to use three examples of evidence of such discrimination in a written summary. The third element of a formative assessment system is feeding forward. Much of what the teacher does through guided instruction is intended to feed forward to modify future instruction. Some of this feeding forward must occur during subsequent lessons, as when Ms. Wainwright made plans for a new lesson on light based on tightly held misconceptions that persisted. In other cases, feeding forward happens more rapidly, as when the teacher directed his student's attention back to a passage in the book about nocturnal animals. In this last example, the questioning led to the use of a cue. Based on the student's response, he was provided with a cue that shifted his attention to an information source. If the student is then able to construct a correct response, the teacher can move on. If the child still does not realize that many nocturnal animals have unique characteristics such as large eyes that enable them to see in the dark, then the teacher reclaims cognitive control by offering further direct explanation and modeling (see Chapter 5). Figure 2.1 illustrates a decision-making flowchart for making instructional decisions based on student responses. Questions within guided instruction are a springboard for further questions, prompts, and cues. When these scaffolds are insufficient, it signals to the teacher that further modeling is needed before the learning progression can continue. We recognize that real discussions are far more complex than the illustration suggests, and we are not suggesting that it is a map of classroom discourse. Rather, it is intended to illustrate the many decision points that occur during an exchange between a student and a knowledgeable teacher. These decisions occur in a split second, making the ability to thin-slice critical during guided instruction. Source: Frey, N., & Fisher, D. (2010). Identifying instructional moves during guided learning. The Reading Teacher, 64(2). © 2010 by the International Reading Association. Used with permission. Intent is the first element of questioning, and the purpose should be to determine what a student knows and doesn't know in order to make the next instructional move. You can see why the quality of the question that is posed is so important. A carelessly formed question from the teacher is more likely to result in a constrained response by the student. After all, it's not the student's job to figure out why you posed the question. Therefore, the next section examines the quality indicators of robust questions. What Is a Robust Question? An I-R-E questioning cycle is not inherently bad. After all, one role of a teacher is to evaluate the nature of the response. However, if the intent is merely to sort the correct from the incorrect, evaluation is reduced to simply keeping score. In addition, we would argue that the quality of the question in the preceding example is pretty low, particularly if the types of questions within the exchange never rise above recall of facts. Further, if the intent is to control rather than probe, this questioning technique is not going to result in much benefit for either the teacher or the student. On the other hand, a robust question is one that is crafted to find out more about what students know, how they use information, and where any confusion may lie. A robust question sets up subsequent instruction because it provides the information you need to further prompt, cue, or explain and model. In particular, you want to determine the extent to which students are beginning to use the knowledge they are learning. In keeping with a Gradual Release of Responsibility model, the expectation is that students are still at an early stage and are not yet at the level of mastery. If students are able to answer robust questions thoroughly, then that is an indication that they are ready to further refine their understanding in the company of peers, especially through productive group work (Frey et al., 2009). We have grouped the major types of questions used in guided instruction into categories. Some questions elicit information, some invite students to link previous knowledge to new information, and some encourage further elaboration or clarification. In addition, robust questioning requires students to problem solve and to speculate. These form the backbone of questioning for guided instruction because they draw on skills and concepts that have been previously taught. These foundational questions provide the teacher with a baseline from which to work. A student who is unable to respond to an elicitation question is likely to need more direct explanation and modeling. Elicitation questions can focus on finite knowledge ("What is the name of the protective case a caterpillar makes as it becomes a butterfly?"). Conversely, an elicitation question might require application-level knowledge ("Why does the chrysalis need to be hard?"). The variable here is what has been initially taught during a focus lesson. That lesson may have been composed of what Bloom (1956) describes as knowledge- and comprehension-level understandings, or perhaps it consisted of application- or synthesis-level knowledge. When asking an elicitation question, the teacher's purpose is to gauge what the student has retained through instruction to this point. For example, after 9th grade English teacher Kelly Johnson introduced her students to persuasive techniques using direct explanation and modeling, she asked them a series of elicitation questions. As she displayed print advertisements on the screen, she instructed her students to identify the techniques used. She showed them a popular ad from the Marines that read, "The few. The proud. The Marines." Her students correctly identified this as including a "glittering generality." Because she had modeled providing the rationale, she asked them to justify their answer. Olivia said, "It's got really powerful emotional words in it, like proud." Elicitation questions can also be posed to unearth misconceptions. When 5th grade teacher Zach Eloy asks a small group of his mathematics students to estimate their answers before calculating the equation 3/8 × 1/2 = _____, he is listening for whether they anticipate that the answer will be larger or smaller than the numbers they began with. Although he has introduced this concept using a think-aloud process so his students could witness how he uses his mathematical reasoning, he is not sure whether this group has yet reached this understanding. His purpose for posing this elicitation question is to see if these learners still cling to the misconception that multiplication always results in a larger number. These questions require students to couple previously taught information with new knowledge. There's a ladder effect going on here. Much like a person using a lower step to hoist himself onto a higher one, some types of knowledge are built in a similar fashion. The Reading Recovery program refers to this as using knowledge "on the run"—that is, applying previously learned information to figure out something new (Clay, 2001). When kindergarten teacher Ming Li asks her students to transform the word goose to loose using the magnetic letters she has arranged on the whiteboard, she is asking them a divergent question, and she is observing how they are using what they know about the letter-sound relationships and the way words work to construct a new word. Some robust questions come as a follow-up probe to an initial question. An elaboration question is used to find out more about a student's reasoning. In particular, these questions invite students to extend their response by adding ideas. For example, 11th grade chemistry teacher Al Montoya pauses at the desk of Edress and reads the student's lab sheet over his shoulder. Mr. Montoya points to the third question, which asks Edress to make a prediction about what will occur when a piece of zinc metal is added to a salt solution and an acidic one. Noting that Edress has written, "I don't think anything will happen to the metal," Mr. Montoya says, "Tell me more about this prediction. Why do you think nothing will happen to the zinc?" By asking Edress to elaborate on his response, Mr. Montoya is probing the reasoning his student is using to support this prediction. As with elaboration questions, which often come after an initial response, clarification questions invite students to extend their thinking by requiring them to provide a clear explanation. A clarification may be genuine, as when the teacher truly doesn't understand a student's response. In other cases, the clarification question is used to further expose student understanding about a concept. In her 7th grade social studies classroom, Cindy Seymour routinely asks clarification questions during guided instruction. "I always remind [students] that they need to 'think like a historian,' so they have to provide evidence. 'Because' is a big word around here." During guided instruction on the narratives of formerly enslaved people in their Southern state, Ms. Seymour asks her students to draw a powerful image of the passage their collaborative learning group read and discussed. When Brandi displays her group's drawing of a whip, Ms. Seymour poses a clarification question, asking them to provide a direct quote from the reading. The term heuristic may be unfamiliar, but what it represents is not. A heuristic is an informal problem-solving technique, sometimes described as a rule of thumb. Our guess is that you have developed heuristics for where to park your car at the mall, choosing a checkout line at the grocery store, and hosting a large family gathering. It's likely that you did not learn these techniques formally, but instead developed them over the years through experience and conversation with others. In classrooms, heuristics refer to the academic problem-solving techniques students use to arrive at a solution. For example, a commonly taught heuristic in mathematics is to draw a visual representation of a word problem to visualize the operation. When 1st grade teacher Marilen Cervantes asks her mathematics students how they keep track of objects they are counting, she is posing a heuristic question. When 10th grade world history teacher George Boyle asks a student to use a graphic organizer of her choice to show the political alliances during the imprisonment of Mary, Queen of Scots, by Elizabeth I, he is posing a heuristic question. An inventive question requires students to use their knowledge to speculate or create. Again, the emphasis is on using information that students have been recently taught in order to create something new. Fourth grade teacher Beth Kowalski asks Ronaldo, who has just finished the latest installment of the Time Warp Trio series by Jon Scieszka and Lane Smith, to make a recommendation about who might like the book. This inventive question requires Ronaldo to consider what he knows about the series and to combine that with newer knowledge on developing book recommendations. Twelfth grade English teacher John Goodwin asks Shaudi to tell him how Ayn Rand's Anthem (2009) helps her to answer the school's essential question, "Can money buy happiness?" Like Ronaldo, Shaudi has to integrate what she knows about different topics and situations to answer the question. Figure 2.2 presents a summary of the various types of questions. In addition to these, there are specific types of questions that relate to texts that students are reading. We'll explore these four types of questions next, then turn our attention to creating a system for using questions. Why does water look blue in a lake, but clear in a glass? Do good governments and bad governments have anything in common? Can you show me where you found that information? Why did you choose that answer? How would you set up this word problem? If I were looking for information about spring in this book, where could I look? How do you know when you have run out of ways to answer this question? If you could, what advice would you give to Napoleon at the Battle of Waterloo? Frey, N., & Fisher, D. (2010). Identifying instructional moves during guided learning. The Reading Teacher, 64(2). © 2010 by the International Reading Association. Adapted with permission. Question-Answer Relationships (QAR) is a system designed to teach students how to locate and formulate answers based on specific types of questions often asked about a piece of text (Raphael, 1982, 1984). This system, which has been shown to positively affect student test scores (Raphael & Au, 2005), consists of four types of questions. The first two types are both explicit questions, meaning that the answer can be found in the text. Right There questions contain wording that comes directly from the text, with an answer often found in a single sentence. Think and Search questions are also derived directly from the text, but the answer must be formulated across more than one sentence. The other two types of questions are both implicit, meaning that the answer cannot be located directly in the text and must be formulated by connecting what the reader knows with the text. Author and You is an implicit question that requires readers to use both information learned in the text and their own background knowledge to answer. The final type of implicit question is On Your Own, which requires readers to use prior knowledge to answer. In this final case, the text may or may not be needed (Raphael, 1986). It is helpful to think of these as "book" and "brain" questions. Right There and Think and Search are book questions, because the answers can be found directly in the text. On the other hand, Author and You and On Your Own questions are brain questions, in that readers must consider what they know as well as what they have learned from the reading. Struggling readers often have difficulty in making decisions about how to answer questions. We've all seen a student futilely searching a text passage for an answer that simply is not there. These same students will often choose a direct quote from the passage even when it is not the correct answer. The QAR approach "clarifies how students can approach the task of reading texts and answering questions" (Raphael, 1986, p. 517). QAR teaches students to locate and justify answers by showing them how to identify four types of questions. Learning to identify a question type and its relationship to the text helps students build comprehension by monitoring and clarifying their reading. Of course, students need instructional scaffolds if they are to use QAR effectively. This scaffolding should start with teachers introducing the question types, if students don't already know them or haven't used them in a while. Figure 2.3 shows a chart that can be used to introduce students to the definitions of each question type. Remember, these scaffolds must be faded so that students get practice with using the tools effectively and independently. Words in the question and answer are directly stated in the text. The question is explicit, and the words or phrases can be found within one sentence. Information is in the text, but readers must think and make connections between passages in the text. Readers need to think about what they already know, what the author tells them in the text, and how these fit together. Requires the reader to use prior knowledge to answer. The text may or may not be needed. Source: From After School Content Literacy Project for California (p. 186), by D. Fisher, N. Frey, and L. Young, 2007, Sacramento: California Department of Education. Reprinted with permission. Although reading and discussing the text is important, the questions students generate allow the teacher to check for their understanding of both the content of what they read as well as their ability to find answers to questions. Mr. Bradshaw: Angelica, what does the author mean by "defenders"? Angelica: People who protected things, like their land and stuff. Mr. Bradshaw: Class, do you agree? Thumbs up or down. [All the students have thumbs up.] Trevor, who won the war? Trevor: It says right in the text that the Greeks did, but I also know that from history. Mr. Bradshaw: Right on. Class? [All the students have thumbs up.] Andrew, describe the journey of the messenger. Mr. Bradshaw: Sad, but true. And along the way? Devon, tell us more. Devon: He ran 24 miles, from Marathon to Athens. He didn't stop for nothing. He just ran. Mr. Bradshaw: Class? [About three-fourths of the students have their thumbs up.] Oh, some disagreement. Tara, care to add? Tara: He did all that, but it was to get the message through. He didn't have no cell phone or anything, but he had to get that message to the people in Athens. Mr. Bradshaw: Yes, that's true. The message to the elders was an important one, and, given the times, there wasn't really another way. But why does the author say "the story continues"? Why that language, Caroline? Caroline: That's what authors do. They continue the story. Mr. Bradshaw: Class? [Nearly all of the students have their thumbs up, indicating they agree with the Caroline's statement.] Ah, I see that we'll need to focus a bit more on author's craft and author's intent. Remember, every word matters. There has to be a reason why the author says this. Let's read on and see what we can find out. We've discussed a number of question types and two different systems for generating questions. Now, let's focus on the questioning process. Implementing such a process provides clues for you to use to guide the learner through prompts, cues, and explanations and modeling. Without a process, questioning can become random and will not result in learning. Without a process, teachers create questions on the spot, and these questions are often lower-level recall questions that do not provide opportunities to clarify and extend students' understanding. This is a problem because we know that students attend to information based on how they are asked about that information. In other words, if they're asked lots of recall questions, they learn to read for that type of information. For example, Reynolds and Anderson (1982) showed that text information relevant to questions was learned better than text information irrelevant to the type of questions being asked. Yes, the type of questions asked does matter. We are also reminded of Durkin's (1978–79) findings that teachers rely primarily on questioning to teach comprehension. Questions don't teach understanding; teachers do. The responses to questions we ask should guide our interactions with students and help us determine how to respond, either with prompts, cues, explanations, or modeling. Remember, we have to do something with the responses we get to the great questions we ask; it's not enough to simply ask students questions. Notice how the questions should be prepared in advance. That's not to say that a perfect question won't arise from an interaction between the teacher and the student, but having questions ready ensures that the teacher is prepared. It also ensures that we know why we're asking a specific question and how we expect learners to respond. Further, as noted in Stage 1, the questions should reflect the instructional purpose and content focus of the lesson. This helps us keep on track and prevents us from taking interesting excursions, or tangents, that do not relate to the topic at hand. As noted in Stage 2, when the question is presented, learners need to be given a response system. Do they talk with a partner? Or do they write or raise their hands? In addition, Stage 2 serves as a reminder to notify the students who will be expected to respond. As we have learned from the research on Teacher Expectations and Student Achievement (Los Angeles County Office of Education, 2009), students need equal response opportunities if they are going to be accountable for the information and receive attention from the teacher. There are a number of ways to ensure that students experience an equal opportunity to respond, ranging from randomly calling on students using Popsicle sticks or the attendance roster to inclusive response opportunities such as dry-erase boards and audience-response systems (also known as clickers, with each student using a device to answer the question). Prompting is also an important part of a questioning system. As noted in Stage 3, the teacher has to pause for the student to answer. TESA, in the category of latency, suggests that the teacher wait at least five seconds after asking a question to see if the student will respond before prompting or moving to another student. The TESA research also suggests that the teacher should wait two to three additional seconds after the student has finished speaking to provide an opportunity for the student to elaborate on the response. In addition, as part of Stage 3, the teacher assists nonrespondents, a skill that is covered in the following chapters. In Stage 4, the teacher processes the student response. This stage involves feedback, prompting, and cueing. Again, the following chapters include guidance for exactly this aspect of the questioning system: what to do when students respond, whether or not the response is correct or appropriate. Finally, in Stage 5, the teacher reflects on questioning practices. This stage includes analyzing the questions to determine if they were effective in checking for understanding and guiding instruction. It also involves an analysis of student response patterns and reactions. Taken together, this system of questioning provides the teacher with an approach to checking for understanding with the goal of addressing student needs through guided instruction. When we're at our best, we guide students by saying and doing the just-right thing to get students to engage in cognitive work. This guidance requires that we link instruction with student responses to the questions we ask. 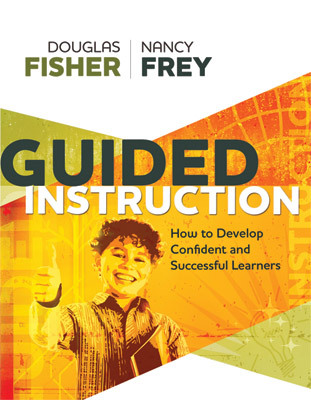 The core assumption in guided instruction is that student responses provide the teacher with insight into what the learner knows and does not know at that moment in time. A knowledgeable teacher—one who possesses both content knowledge and a deep understanding of how a novice learner approaches a new concept—rapidly hypothesizes the learner's current state and responds with prompts, cues, or direct explanation and modeling when needed. The ability to expose student understanding or partial understanding requires anticipating misconceptions and posing robust questions. These robust questions are purposeful and are designed to elicit information about previously taught concepts and to encourage linking previous knowledge to new. In some cases, further elaboration or clarification questions are needed to unearth student knowledge. Robust questions can also be used to give the teacher insight as to how a student solves an academic problem, and inventive questions invite students to speculate. It is useful for students to learn about questions in order to locate information in their heads and in their materials. The Question-Answer Relationship instructional routine is especially relevant for showing students how they know the things they know. Right There and Think and Search questions are explicit, and the answers can be found within the text. On the other hand, Author and You and On Your Own questions require the learner to synthesize knowledge found both within and outside of the text. Just as these techniques can be taught to students, so can other techniques be used by teachers to improve questioning. These techniques include planning questions in advance, providing wait time, and using follow-up probes to encourage further response. Most important, student responses should be analyzed in order to plan both immediate and subsequent instruction. It is this diagnostic intent that lifts questioning from merely keeping a tally of correct and incorrect answers to more sophisticated guided instruction. Merely asking questions doesn't equal guided instruction. But when the questions are robust and purposeful, and are used to hypothesize student knowledge, the prompting and cueing that follow scaffold student learning. Copyright © 2010 by ASCD. All rights reserved. No part of this publication—including the drawings, graphs, illustrations, or chapters, except for brief quotations in critical reviews or articles—may be reproduced or transmitted in any form or by any means, electronic or mechanical, including photocopy, recording, or any information storage and retrieval system, without permission from ASCD.